And that seemed to show up in the numbers. Morgan Stanley said that much of its gain came from commodities trading. Excluding that, FICC trading would have been down. Equity trading rose nearly 27 percent from a year ago, but that trailed all of its rivals except JPMorgan Chase & Co.
Morgan Stanley’s wealth-management business, however, showed that it can withstand market gyrations. Revenue there was up 8 percent. And Morgan Stanley also reported a jump in mergers and acquisition advisory fees, compared with a drop for Goldman. All told, Morgan Stanley’s $1.45 a share in earnings beat expectations of $1.25. A case could be made that the results are better than they appear. After the financial crisis, the big banks, and in particular Goldman and Morgan Stanley, took different paths. Morgan Stanley bolstered its asset-management business and headed down the road of becoming less risky and more dependable. 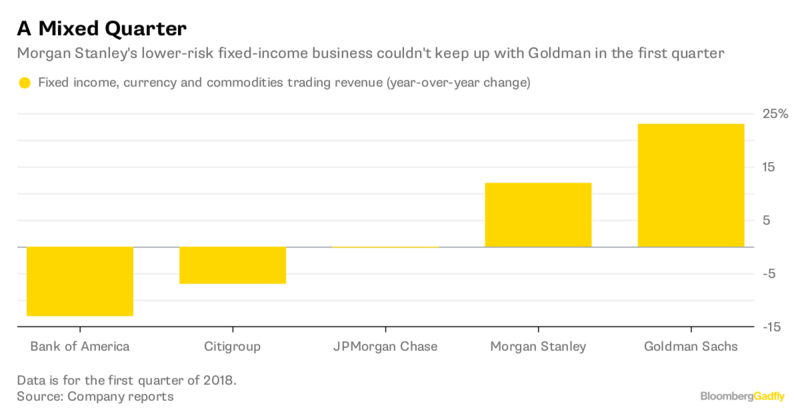 Goldman tacked back toward trading and its private-equity business, at least as much as it could get away with under the new rules. Morgan Stanley by design said that it was aiming for a firm with a smaller but more dependable trading business. And this quarter, in a rocky market, that’s what it got. Morgan Stanley acknowledged that a smaller trading division would mean lower returns than its rival Goldman but that shareholders would reward it because it was taking less risk. But it was always a question whether shareholders actually would. And it’s not clear they are. Morgan Stanley’s shares trade at nearly 1.4 times book value, about the same as those of Goldman, which has struggled lately. The truly good news for Morgan Stanley is that its returns, 10 years after the financial crisis, are not that much different from Goldman’s. Morgan Stanley, like the other big banks, reported a large jump in return on common equity, propelled by the tax cut, to 14.9 percent. Goldman’s ROE was 15.4 percent. Morgan Stanley’s stock has risen just more than 30 percent in the past year. Goldman’s has been up just less than 20 percent. Now comes the test of whether Morgan Stanley has outperformed Goldman in shareholders’ eyes because they like what Gorman has done or if they were just cheering a couple of rival-beating quarters.